A 58-year-old woman died Friday morning when the scooter she was riding was struck by an SUV on Mill Woods Road, say Edmonton police. 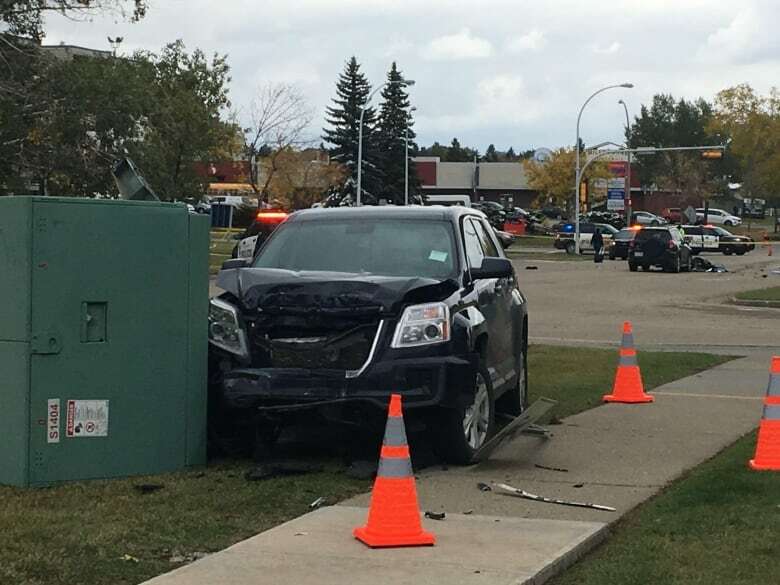 Police said a Suzuki scooter was southbound on Mill Woods Road when it was struck by a dark-blue GMC Terrain travelling north. The SUV had reportedly crossed the centre line, police said in a news release. Emergency medical services responded but the scooter rider died at the scene. The 45-year-old man who was driving the Terrain was not hurt. The Major Collision Investigations Unit continues to investigate, police said. Mill Woods Road was closed in both directions between 38th Avenue and 85th Street after the crash. The wreckage of a scooter could be seen on the road, near the front bumper of a dark-coloured Toyota SUV. Several police cruisers were on scene, along with paramedics and EPCOR crews who were working on a power outage. The Terrain, with front-end damage, appeared to have veered off the road and hit a large electrical transformer box. Charles Kim had stepped outside his apartment for a cigarette when he witnessed the crash. "The sound of the impact was like an explosion," he said.